Home Happenings IKEA Online Shopping is Now a Thing! I think I can safely say that I’m not alone in anticipating IKEA’s online shop. IKEA in Damansara is always crowded for some reason, and half the people there don’t buy anything! Finally, those who hate crowds but need certain home items can buy them from the comfort of their homes! Browse through items, and select desired items. Add to cart, and adjust desired quantity. Confirm order and proceed to checkout. Select payment method and finalise payment. And that’s it! Once your transaction is successful, you will receive your order confirmation through email. At the moment, only Mastercard and Visa payment options are available. IKEA offers two types of delivery options: via parcel or truck. In West Malaysia, a parcel delivery is RM 40, whereas a truck delivery starts at RM 98 depending on your location. In East Malaysia, a parcel delivery is RM 100, whereas a truck delivery is at RM 675. For East Malaysians, there is also a “Click & Collection” service at RM 575, where customers can pick up their goods at allocated points. 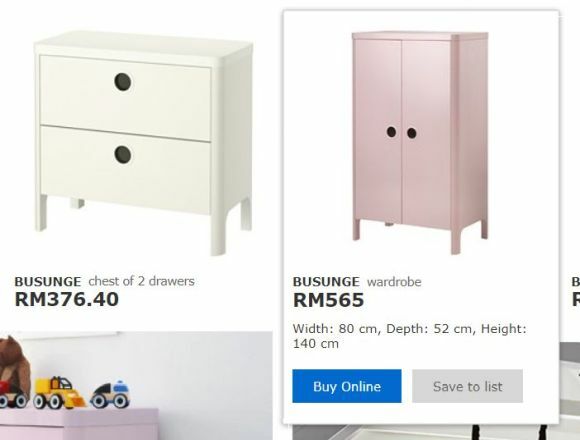 Since IKEA just launched it’s online shopping service, it’s perfectly normal that they haven’t included everything to be sold online. While browsing, if you don’t see the “buy online” button, I’m sorry. You’ll have to make a trip to get that piece of furniture. Nevertheless, we are hoping that more items will be available to purchase online. Maybe one day, we could even order their meatballs online!